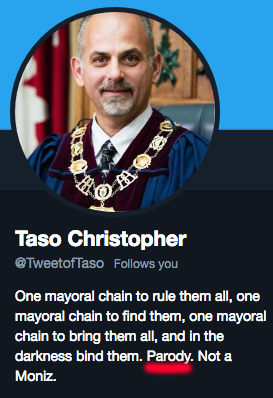 BELLEVILLE — The municipal election is less than a month away, and you might see some odd posts from Taso Christopher on Twitter — that’s because it’s a parody account. The account has over 300 followers and tends to post political jokes poking fun at local politicians and Christopher himself. It was created in January 2015, a couple of months after Christopher was elected mayor. It is unknown who runs it. QNet News called and emailed Christopher and his campaign office this week for comment on the account. There has been no response to date. Christopher had a Twitter account while he was running for mayor during the 2014 campaign, but he left Twitter shortly after the election. The municipal election will be held Oct. 22.